With hundreds of practice questions and hands-on exercises, this book covers what you need to know--and shows you how to prepare--for this challenging exam. Kathy Sierra is a co-developer of the SCJP exam and Sun's practice exam. She is also a Sun Certified Java Instructor and the founder of the world's largest Java certification website, Javaranch.com. 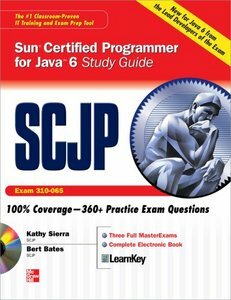 Bert Bates is a Sun Certified Programmer for Java and has participated in the development of the SCJP exam and Sun's practice exam. He is the coauthor, with Kathy Sierra, of the previous editions of this book.